Study for a qualification in ITIL Continual Service Improvement (CSI) by taking an online training course from 4PA! Our course has been accredited by PeopleCert, who are licensed by AXELOS as an Examination Institute for an ITIL Continual Service Improvement qualification in IT Service Management. ITIL Continual Service Improvement is a free-standing qualification and is one of five ITIL Service Lifecycle modules that can work towards you achieving your ITIL expert qualification. The purpose of this course is to help you gain a detailed understanding on industry practices in service management as documented in the ITIL Continual Service Improvement publication. Continual Service Improvement is responsible for continually aligning and realigning IT services to changing business needs by identifying and implementing improvements to IT services that support business processes. With this course, you’ll receive 6 months access from the date of purchase as well as a FREE exam voucher to use whenever you are ready to sit the exam! The purpose of this course is to help you gain detailed knowledge on industry practices in service management as documented in the ITIL Continual Service Improvement publication. This course is intended for management and supervisory level staff. You may be involved in Continual Service Improvement yourself, or you may just wish to understand the processes and principles involved, as they affect the work that you do. The CSI qualification focuses on how organizations and individuals can strategically review the products and services they have produced following the strategy, design, transition and operation stages of the IT Service Lifecycle and offers guidance on how this process should be organized and executed. Our course has been fully accredited by PeopleCert, who are licensed by AXELOS as an Examination Institute for IT Service Management. Why Study ITIL CSI with 4PA? Our courses are easy-to-use. Participants will benefit from an interactive multimedia environment that enhances the way you study. This eLearning course contains all the learning materials you need in order to prepare for the ITIL CSI exam. Our course has been accredited by PeopleCert, who are licensed by AXELOS as an Examination Institute for the ITIL® Continual Service Improvement Certificate in IT Service Management. The official mock exams are provided and the course includes a module on how to approach these, working through some examples. In addition to the resources provided, the examination guidance recommends that candidates should complete at least 21 hours of personal study. This module covers the core concepts of Continual Service Improvement in terms of its purpose, objectives, scope and its relationship to the other ITIL lifecycle stages. The module covers the managerial and supervisory aspects of the CSI process. It excludes the day-to-day operation of each process. More detailed process operation guidance is covered in the service capability courses. Each process is considered from the management perspective. That means at the end of this module you should understand those aspects that would be required to understand each process and its interfaces, oversee its implementation and judge its effectiveness and efficiency. This module introduces the methods and techniques which are primarily used to deliver CSI. The area of focus in this module relates to how to perform and interpret assessments, gap analysis, benchmarking, service measurement, metrics, balanced scorecards, SWOT analysis, service reports and return on investment. The module also explains how CSI can use availability, capacity, IT service continuity and problem management to support its activities. This module covers the roles relevant to CSI and the nature of the activities and the skills required for the seven-step improvement process as well as how authority matrices (RACI) are used by CSI. This module covers the technology and tools used to support CSI. In particular, holistic IT service management tools as well as tools for system and network, event, performance, project and portfolio and financial management.  The technology and tools used to support CSI, in particular, holistic IT service management tools as well as tools for system and network, event, performance, project and portfolio and financial management. This module covers the factors to be considered when implementing Continual Service Improvement. It specifically looks at when and where to start, the role of governance and the effect of organizational change. The learning objective for this module is to understand the challenges, risks and critical success factors relating to CSI. This unit summarizes the material covered in the previous units and prepares candidates for the examination. It is likely that most course providers will wish to offer and review at least one opportunity for a mock examination. Thinking of sitting the ITIL Continual Service Improvement Exam? On this page, you will find everything you need to know! In order to achieve this ITIL Intermediate qualification, you must pass the ITIL® Continual Service Improvement Certificate in IT Service Management exam. You can take the exam online (virtually) using a service provided by PeopleCert. The examination will consist of a complex multiple choice, scenario-based closed book paper of 8 questions, to be answered within 90 minutes. To pass the exam you must get 28 out of 40 questions correct, or 70%. The course materials provided in the Continual Service Improvement eLearning course will provide you with all the information you need for this exam. Exam Duration: Maximum 90 minutes for all candidates in their respective language (Candidates sitting the examination in a language other than their first language have a maximum of 120 minutes and are allowed to use a dictionary). Before you book you can test that your computer configuration will meet the requirements for a PeopleCert exam, using this online test. This test focuses on the suitability of your webcam, microphone and internet connection. Please Visit the PeopleCertwebsite for a complete list of information and guidance. Why not try out a free trial module from our ITIL Continual Service Improvement e-Learning course! In this ITIL Intermediate trial module, you will learn about the core concepts of Continual Service Improvement in terms of its purpose, objectives, scope and its relationship to the other ITIL lifecycle stages. 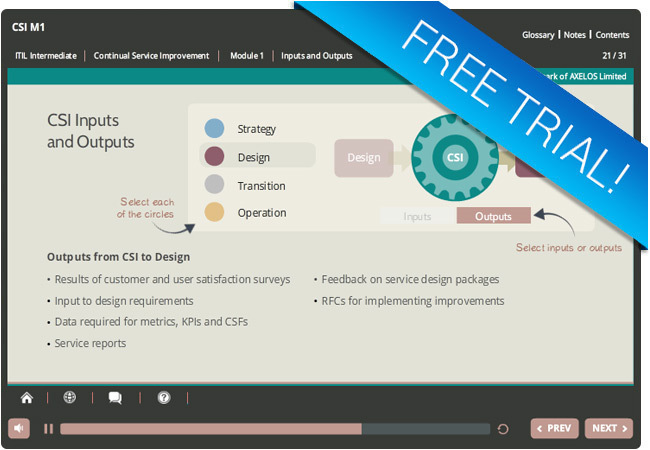 Like the full ITIL Continual Service Improvement (CSI) eLearning course, you can access this free trial module from any device whether you are at home, at work, or on the move! ITIL® and the The Swirl Logo™ are registered trade marks of AXELOS Ltd. Used and reporodued with the permission of AXELOS .